Should Hit the Dirt be vet Ability? COMES WITH POLL AND WHY AM I IN CAPS NOW? Blitzkrieg- Great, really cool. in the matter of fact, so cool its giving my buns frostbite. wait.. hold on. I need to warm my buns for a minute. "But Grittle! I completely ignored the title of the thread and only read it because I have absolutely nothing to else to read on currently! when are you going to do your balance magic"
Well, its not balance first off, there Suggestions. I can trust the Relic could and probably have better suggestions and ideas than I can provide for their complex and patented Balance machine. But nerveless I move on, struggled by the fact that my buns are still frosty from blitzkrieg's coolness. Now my suggestion is an extremely complex process, requiring precision, advance trigonometry and calculus, and the required use of chemistry to conjure up such a delicate, yet fruitful suggestion. Replace the Tripwire Flares vet ability with Hit the Dirt for Conscripts and Guards only. and replace Hit the Dirt on the 2, rarely used, Doctrines that do use Hit the Dirt as an Ability the the Not one Step Back Doctrine's Commissar. 1- Conscripts become abit more useful late game -- GASP -- regardless of Doctrine chosen! Giving them more durability options when against late game foes. thus increasing utility and less QQ in the forums, and thus less money needed for the Forum Moderator's Aspirin Bill. same goes for guards. But because I like consistency. 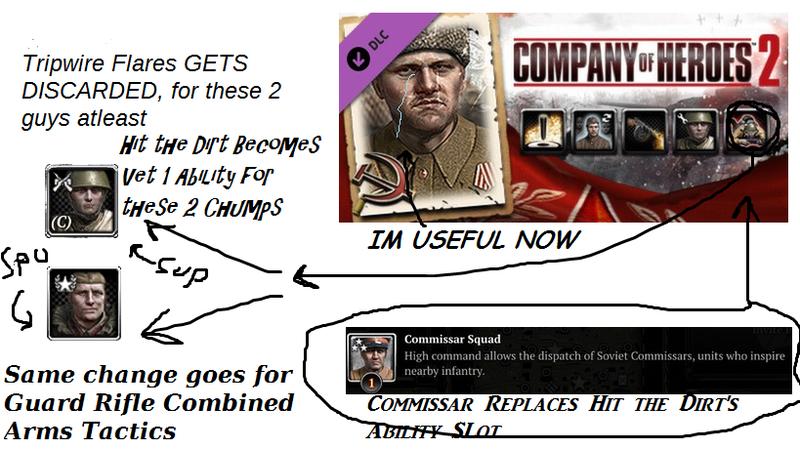 3- There are more 2 more Soviet units with better vet abilities. Hooray!!!!! "But Grittle, I, for some reason, can't read! could you give me some form of visual aide?"